For our Chunky Cable Alpaca Blanket starts out with the warmest, softest, most comfortable, all-natural alpaca fiber. 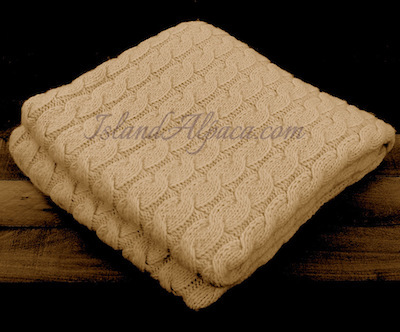 The natural breathability and moisture wicking properties of the alpaca combined with the loft of the oversized cable knit pattern make this blanket one that will keep you warm and comfortable year-round. A generous size, made with ultra-thick, chunky yarn. It is luxuriously soft to the touch, making it perfect for layering over a bed, or draping over a loveseat or sofa. The evident quality and finesse of this heirloom blanket truly adds more "home" to your house. or someone who has it all and appreciates the best! Island Alpaca Company contributes fleece to our local alpaca fiber cooperative. Free shipping for this item and for all orders over $100! At Island Alpaca, we give regular fiber supplements and ground flax daily to our alpaca, helping to promote overall good health and a superior quality fleece. 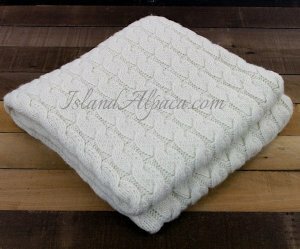 Our alpaca fleece is so fine, that, last year, a large portion of our "seconds"Â� (neck fiber) were re-sorted into the "prime"Â� (blanket) category. Our textile lab has shown results that indicate that our alpaca are some of the finest in the country.